Out of curiosity yesterday, I did a little experiment. I mixed one load's worth of laundry detergent with a pint of water, and watched to see what would happen. I'm not a scientist, and I'm sure this experiment doesn't hold much weight, but it was enlightening to me to see the results. I have used a certain brand of laundry detergent for years - I cloth diapered my kids, and used it to clean their diapers, and eventually all of our clothes, towels, sheets, etc. 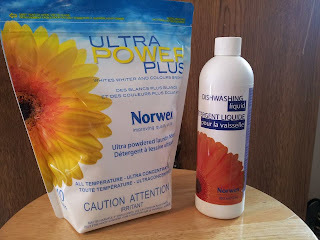 I've honestly had no problems with it, and have been reluctant to make a change to Norwex Ultra Power Plus (UPP) because it is marketed as extremely similar (no dyes, fillers, etc) to what I was using. However, this little experiment leaves me wondering. The picture below shows pint glasses filled with hot water from the tap (obviously, it has since cooled, and doesn't look any different). I added one load's worth of laundry detergent to each pint glass. I took pictures at one minute, five minutes, and thirty minutes. It's been almost 24 hours now, and they haven't changed. All that stuff is what's left behind on clothes or whatever is washed. The Rockin Green soap has actually settled to the bottom of the jar - probably exactly the amount I put in, it doesn't look like anything has dissolved. Maybe your washer's rinse cycle clears it out. Maybe an extra rinse cycle clears it out. I'm not a laundry expert, so I'm not sure! My chemist friend said my experiment was flawed - the results don't really show anything significant - but it does show you how much gunk (fillers, surfactants, dyes, fragrances, etc) goes into your laundry machine, and what might be clinging to the fibers in your clothes. If you have sensitive skin, allergies, or reactions to certain things, maybe your laundry detergent is to blame. I know I'll be choosing the cleaner option from now on! 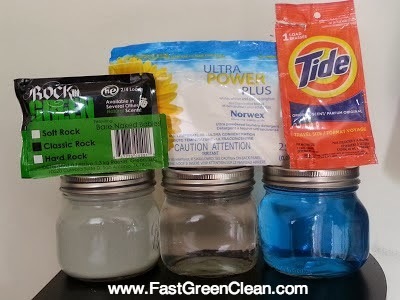 I've had a few friends contact me with results of their own laundry detergent experiment using other detergents. ECOS, All Free and Clear, Dreft, and the Costco brand detergents all leave behind cloudy water. The pods are no different - they also leave colored, cloudy water. It may not show anything significant, but it is enough for me to make the change to UPP for my own family's laundry. If you're interested in trying out the UPP, or being included in my newsletter to receive exclusive offers for my customers, please let me know! Do you have a little one at home? Do you have friends who are pregnant or recently gave birth? Did you know Norwex has some fantastic products that will help the new parents? The Baby Body Pack is an amazing set of face/body antibac microfiber cloths that work just like the Body Pack, but is made in a smaller size perfect for your baby. The Baby Body Pack is gentle and soft, which makes it ideal for baby's sensitive skin. Plus, with all the extra baby laundry, the Baby Body Pack cloths can go several days without washing - just rinse and hang to dry after use. Cleaning baby's face and body without the use of harsh cleaners, soaps, and chemicals (just water!) - great for baby acne, dry skin, eczema, etc. Wiping baby's bottom instead of using disposable wipes laden with chemicals. The Baby Hooded Towel Set is an excellent choice for new parents. 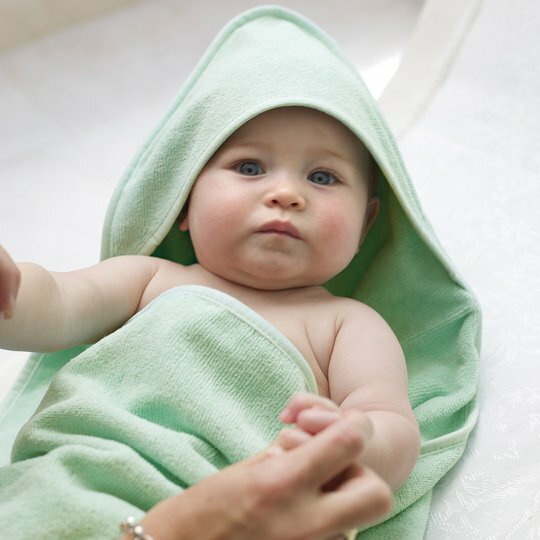 Most baby towels are thin and not absorbent. 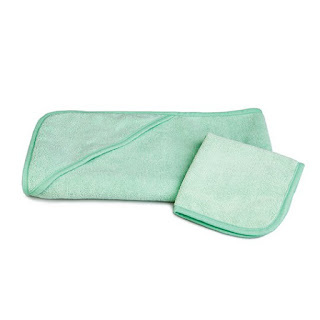 The Norwex Baby Hooded Towel set is microfiber and will dry and keep your baby warm at all times! The set includes a hooded towel and face cloth, and can be used for babies and toddlers. The set can be used to clean, dry, and keep baby warm. Use a patting motion rather than a rubbing motion. The towel is soft and fluffy, super absorbent, warm, and comfy. It absorbs water from skin so the baby doesn't get chilled after bath time. New moms LOVE this set! Don't forget the Laundry Detergent and Dryer Balls for all the baby laundry. The laundry detergent is filler-free and unscented, and will not leave any residue in your clothing. It has superior stain removing properties, whitens whites, brightens colored fabrics, and cuts through grease and dirt leaving clothes soft and fluffy. An added benefit is that most fabrics will not build up static in the dryer as there are no fillers left in the clothing, which eliminates the need for fabric softener and dryer sheets (both are also laden with chemicals!). Use the Norwex Dryer Balls for a softer feel. The Norwex Dish Mat is great for all those baby bottles, pump parts, and other items that need to be hand washed and dried, or aren't suitable for the dishwasher. Eliminate drenched towels on your counter! 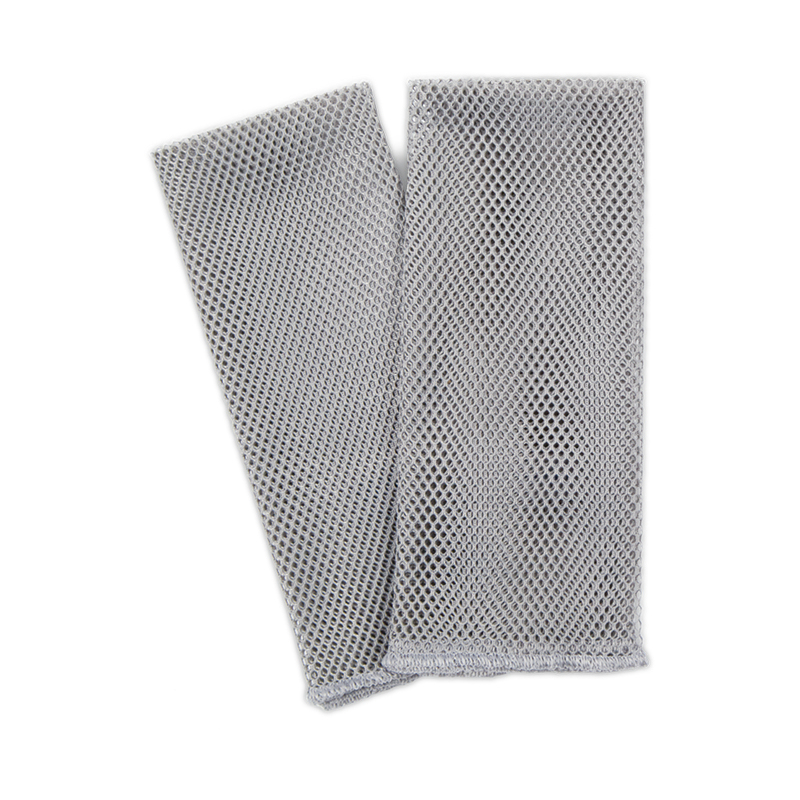 The mesh side of the Dish Mat allows air to flow through (always place this side up! ), while the microfiber soaks up excess moisture. Don't forget the Odour Eliminator! 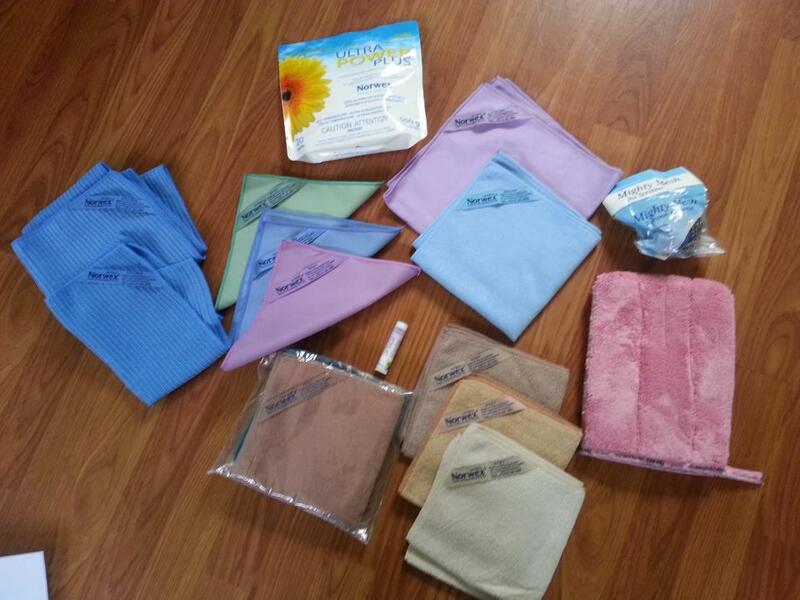 These products can be used to combat the stinky side of having a baby at home - dirty diapers! Odour Eliminator's bacterial spores work to eat up the organic matter causing the odor. It can be used anywhere unpleasant odors present a problem, and can also be used with rug shampoo solutions to eliminate carper odors (baby spit up, anyone?). It seems so simple, but the Norwex Dish Cloth is an awesome (and affordable!) addition to your kitchen. It is a loosely woven white nylon netted cloth. This means it dries quickly and will not absorb grease or odor. Please note, it may scratch acrylic or delicate surfaces. My favorite use (so far)? Getting rid of the dried, caked-on remnants of scrambled eggs in my skillet. The Dish Cloth leaves my pans clean with far less effort. Two thumbs up from me! 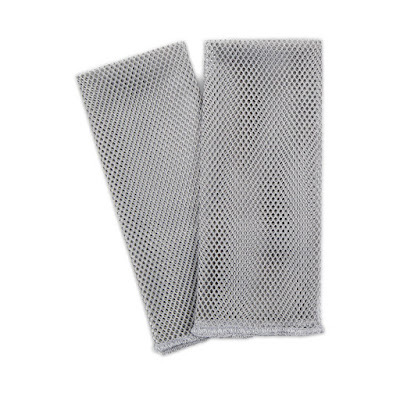 Washing your dishes can be a chore, but our set of two specially woven, netted Dish Cloths you can do your dishes and so much more, with ease! 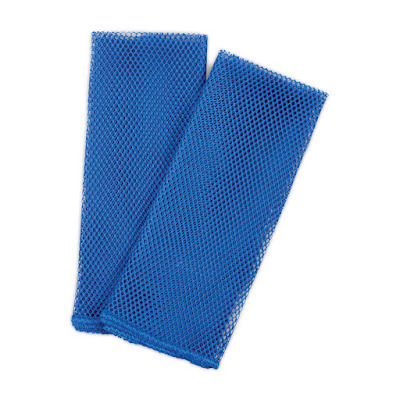 Great for everyday use, these non-absorbent cloths will do some heavy duty cleaning anywhere scrubbing action without a lot of water is required. They're great for removing flour, dough and other sticky substances from countertops after baking. Fruits and vegetables are sprayed with toxic chemicals to protect them from pest and fungal attacks. They are coated with a wax/oil to prevent decay and to preserve the quality and appearance of the produce during transportation. This waxy layer is also host for microorganisms like bacteria, fungi and viruses. The Norwex Veggie and Fruit Scrub Cloth is superb quality and perfect to use for cleaning fruits and vegetables. There is a rough side for scrubbing and a smooth side for polishing. It is highly effective for removing dirt and debris from all your fruit and vegetables. Wipe down all produce even if you will be peeling it. By doing so you prevent contaminating the flesh of the produce as you remove the skin. Place in lunch bags, take to the office, keep in the kitchen and take on a picnic for handy access to cleaner, healthier produce. 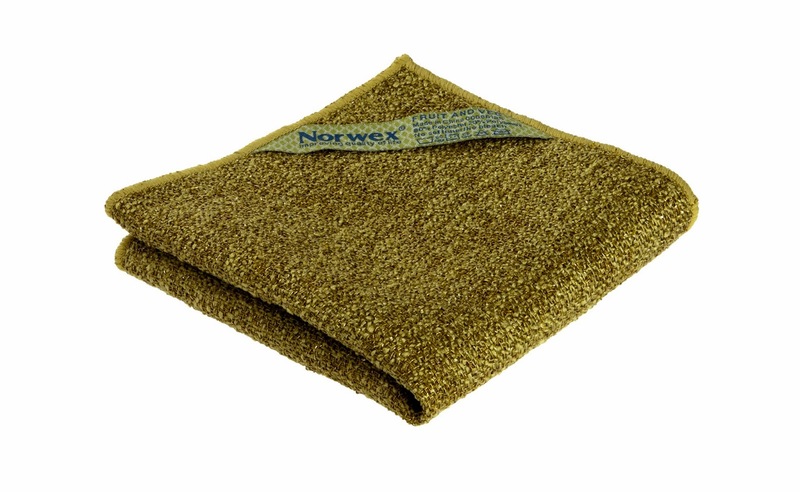 For delicate or hard to clean produce, use Norwex Fresh Wash in conjunction with the Veggie Cloth to remove contaminants more easily and efficiently. This combination is extremely effective when cleaning waxes and pesticides from fruits and vegetables. Studies show that the following fruits and vegetables consistently have the largest number of trace levels of pesticides: Celery, peaches, strawberries, apples, blueberries, nectarines, bell peppers, spinach (includes kale and collard greens), cherries, potatoes, grapes and lettuce. Looking for a great teacher gift? The Household Package (Enviro Cloth, Window Cloth, and Dusting Mitt) will keep your favorite teacher's classroom clean and germ free using only water! The Enviro Cloth will clean desks, pencil sharpeners, doorknobs, sinks, white boards, computer keyboards, tables, and even remove left over adhesive from stickers. Anything that students' hands come in contact with, the Enviro Cloth can clean and sanitize with just water. Add in the Window Cloth for windows, projectors, and anything else that shines for a streak-free finish every time. No more chemicals, no more paper towels! Save money, time, and the environment by using Norwex. Because of the micro silver embedded in the cloths, once the Enviro Cloth lifts the dirt, grease and other particles off the surface, the micro silver goes to work with self-purification properties against the mold, fungi and bacterial odor. By the time the cloth is dry, it is completely purified! This means the teacher won't have to wash cloths after every use! It's amazing what a one-on-one demo of Norwex products will do! If you'd like to see some of our products in action, let me know. We can schedule a time so I can show you how easy it is to clean with ONLY WATER, how safe and effective it is without chemicals, and how much money you can save by eliminating harsh toxic cleaners from your home. Is the pollen on your car making you crazy (or sneezy)? The April Customer Specials include the Clean Machine Exclusive special - an enviro cloth, a car wash mitt, a spray bottle, and a car cloth - ALL you need to wash your car with JUST WATER! No more soapy buckets, scratchy cloths and sponges, or harmful chemicals. Check it out! I know most of my friends haven't heard of Norwex, but it is a HUGE company - 20,000+ consultants, including in Europe (where they have banned many of the chemicals still in cleaning and personal care products in the USA). 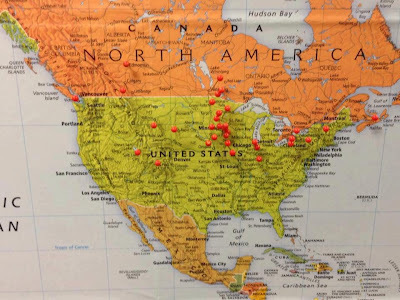 The red dots on the map? Those are Senior Executive Sales Leaders (75+ people on their team). The entire Southeast is open. What would it take to let me show you a few Norwex products, to show you how fast, green, and CLEAN your house can be with just water? What would it take for you to invite some friends to a show, and for you to earn a few hundred dollars worth of FREE Norwex products? What would it take for you to join my team? 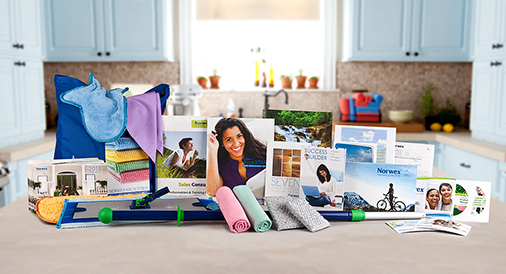 There is NO SIGN UP FEE with Norwex, and you have 90 days to qualify (sell $2000 in product) - and I'll help you get there (average parties are $500)! There is so much potential with Norwex - especially in this area. What do you have to lose? ASK me the questions. SEE the products. KNOW the difference. STOP using toxic chemicals. Do the BEST for you and your family. Can you imagine NEVER buying body wash, face wash, exfoliating wash, etc. EVER again? The Norwex Body Pack can be used to wash your face and body WITH ONLY WATER. Seriously. Think of all those ingredients and chemicals you won't be exposed to anymore! (Sensitive skin? The makeup removal cloths are more gentle and designed for use around your eyes.) P.S. - Both the Body Pack cloths and the Makeup Removal cloths remove makeup too - even mascara and eyeliner! Do you want to remove your makeup and clean your face with only WATER? 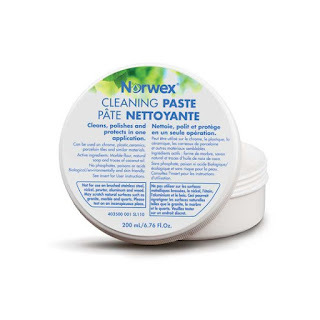 Try the Norwex Makeup Remover Cloth - a super soft, unique product that will quickly and easily remove debris, oils and makeup (including eye makeup, eyeliner, and mascara!) from the face, neck and delicate eye area- USING ONLY WATER! No more harsh chemicals or irritated eyes! Amazing! That's why the Norwex Envirocloth outperforms other cleaning methods and continues to gain popularity. It's hard to comprehend how a cloth and water could clean faster, easier, and more thoroughly than traditional methods but once you use the Envirocloth and see for yourself, you'll never imagine life without it. What makes Norwex Microfiber better than all of the rest? 1. There are over 2.9 million microfibers per Enviro Cloth. 4. This will pick up EVERYTHING on your surfaces. 6. Microsilver has self cleaning properties - so that means less laundering. 7. Super absorbent and they do not cross contaminate! 8. Norwex microfiber has been tested for 500 washes. That means, if you launder it once a week it will last you 10 years! 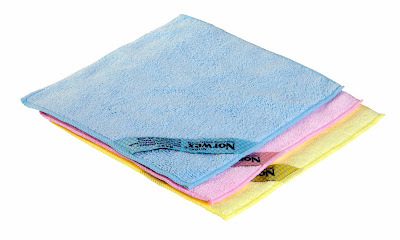 This multipurpose, antibac, microfiber Enviro Cloth removes dust, dirt, and grease from all washable surfaces. It is your "all-purpose" cloth, and removes stains from carpet, clothing, and furniture, cleans floors, walls, counters, vehicles (inside and out), siding, just about anywhere you can imagine. Traditional cleaning products are disposable, causing millions of pounds of plastics and refill items to be thrown into our landfills, not to mention the toxic chemicals filling our waterways and harming our wildlife. 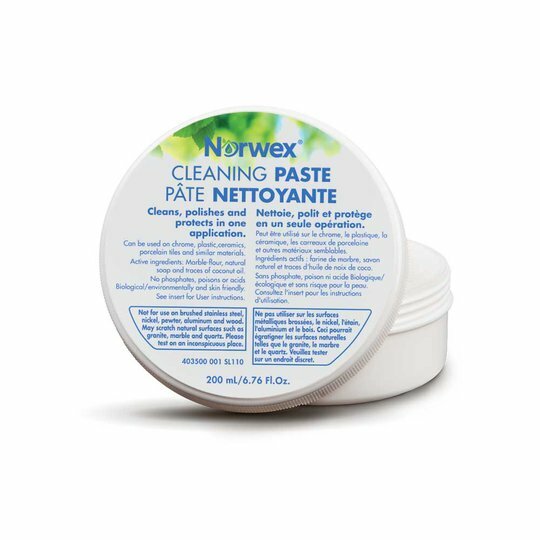 Why pay more for toxic, landfill-bound products when you can clean safer and more effectively for less money with Norwex? Concerned about costs? 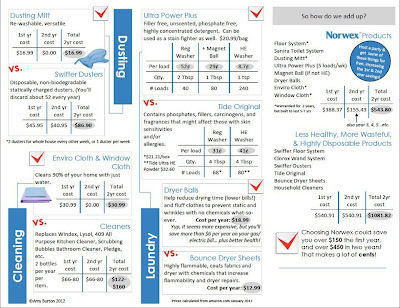 Switching to Norwex products will actually SAVE you a significant amount of money! 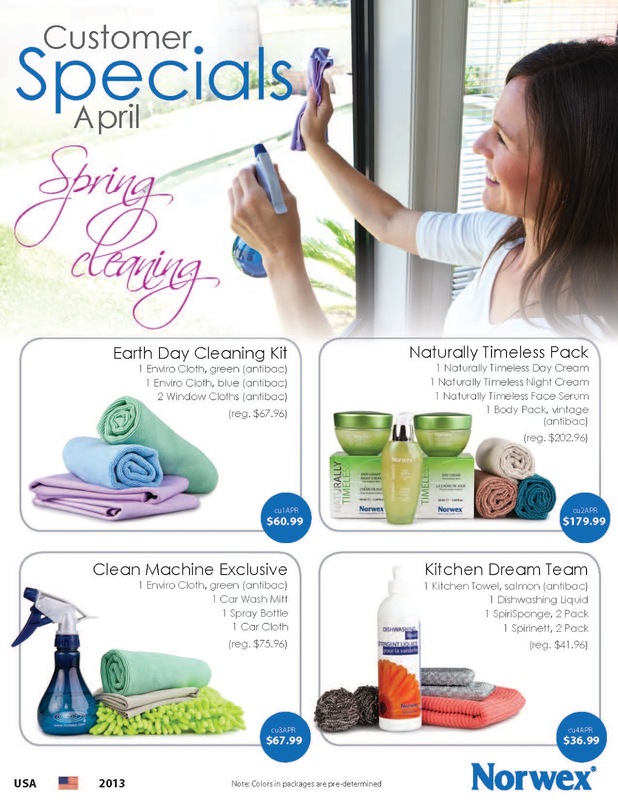 Our Household Package (1 enviro cloth, 1 window cloth, 1 dusting mitt) will replace the need to buy scrubbing bubbles, pledge, clorox clean up, disinfecting wipes, paper towels, pledge, windex, lysol, 409 all purpose cleaner, swiffer dusters, etc. You can clean almost your entire home with just these three items, and they come with a 2 year warranty AND a 60 day money back guarantee, so you can't go wrong with giving the products a try. Look on the right in this graphic - you can see how much money you can SAVE ($150+ the first year, $450+ every subsequent year) just by switching to Norwex products!